At HGC Construction, we are proud of our collaborative and welcoming workplace culture. But we know that a lot of what makes our culture great is due to our incredible staff. Each month we highlight one member from our team. This month, get to know one of our Superintendents, Russell “Buster” Craddock, who has been with HGC for nearly four years and has contributed to several projects including Summit Country Day and AssuredPartners NL. Do the best I can do at all times. Treat all as I would want to be treated. 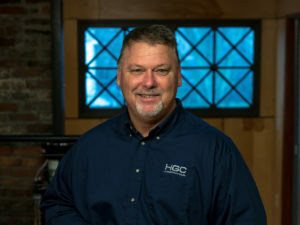 WHAT IS YOUR FAVORITE ASPECT OF WORKING AT HGC? The people…just great people, everyone treats one another like family. I am a Pro Staff Member for an outdoor show called Rack and Tracks TV. My son and I appear on the show several times a year. WHAT IS YOUR FAVORITE PROJECT THAT YOU’VE BEEN A PART OF? Summit Country Day School Exterior addition. WHAT HAS CHANGED THE MOST IN THE INDUSTRY ACROSS YOUR CAREER? The use of GPS units and use of CAD. Spend time with my family and enjoy the outdoors. WHAT ADVICE WOULD YOU GIVE A NEW HIRE? Prepare yourself for the ride. If you are willing to work and learn, you’re in the right place.